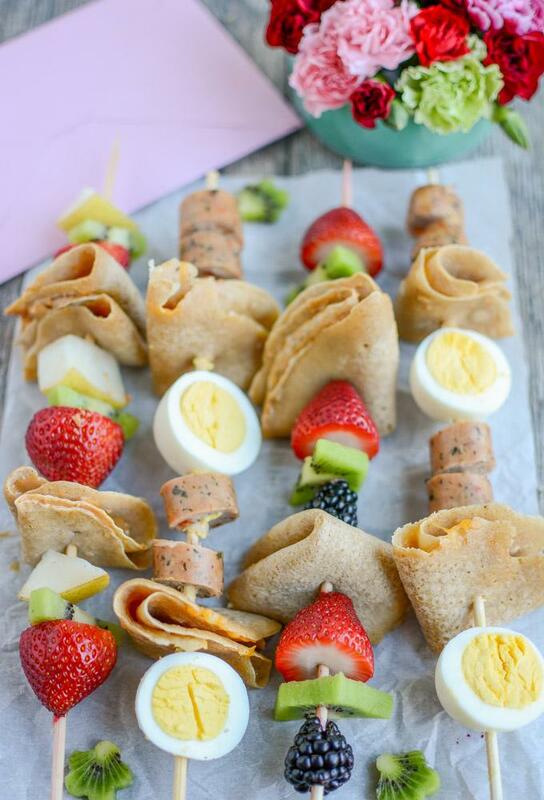 These Crepe Kabobs are fun, kid-friendly breakfast treat! 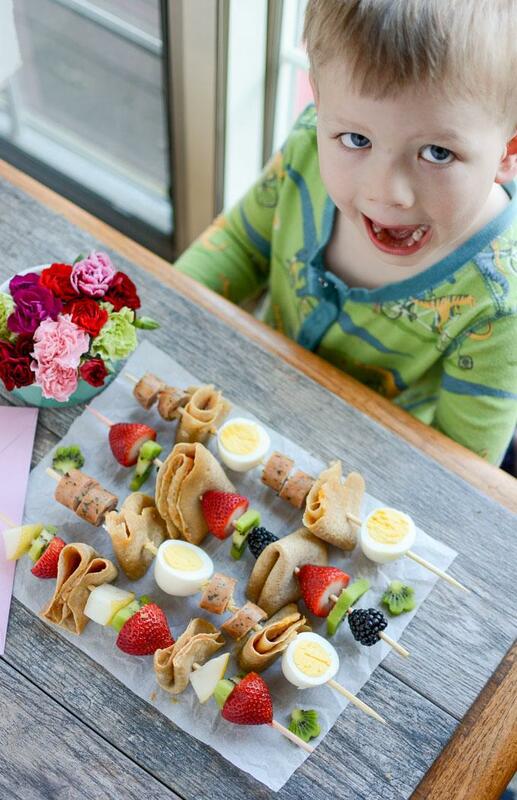 Make them sweet with peanut butter filled crepes and fresh fruit or savory with cheese-filled crepes, sausage and eggs. Thanks to Meijer for sponsoring this post. I’m super excited to introduce a new partnership today with my friends at Meijer. 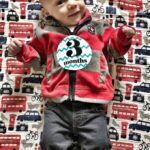 If you’ve followed me for a while, you know that Meijer is where we shop weekly, so teaming up with them was a perfect fit! 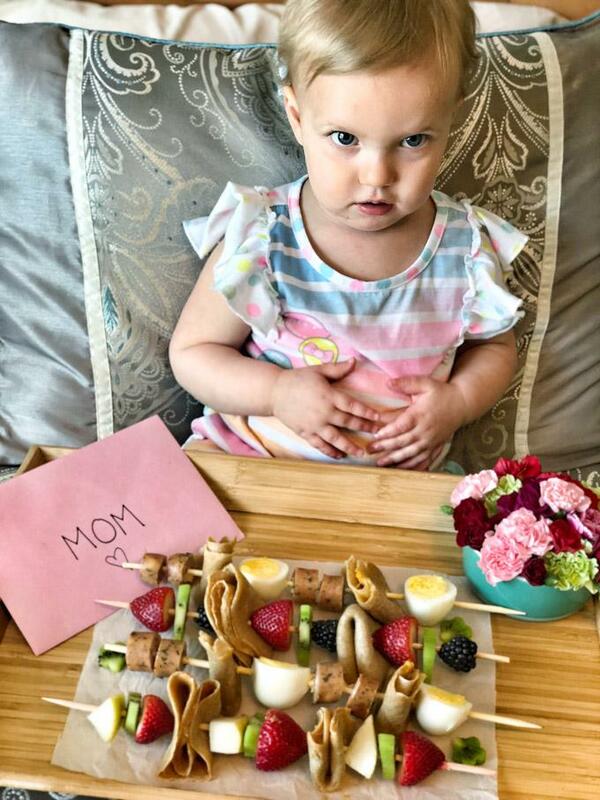 Today we’re kicking things off with these Crepe Kabobs that just so happen to be perfect for Mother’s Day! 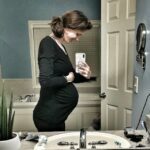 As I was brainstorming for this post, I wanted to come up with something super easy and kid-friendly because you guys know I’m a big fan of getting the kids in the kitchen! 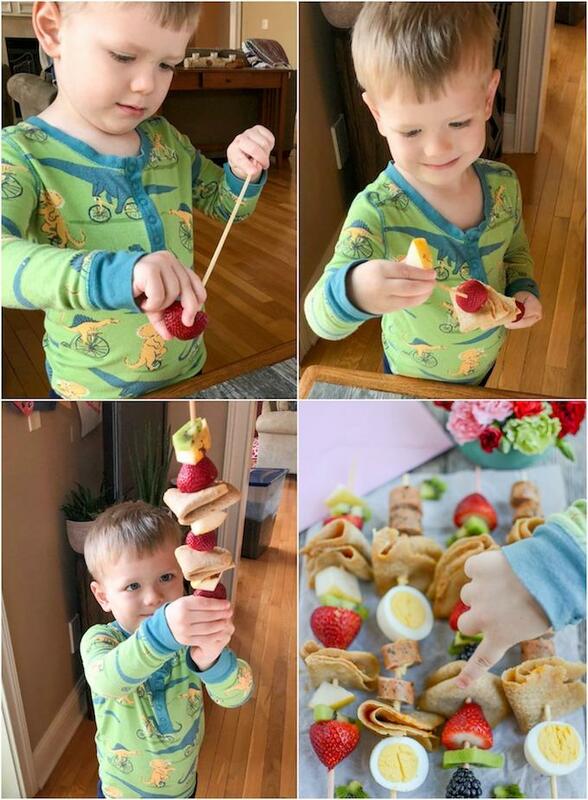 These Crepe Kabobs are perfect for little hands to help assemble and just require a little help from dad or another adult to make the crepes in a hot pan! The crepes can even be made the night before for easy assembly in the morning. My toddler was super excited about this morning project and so proud of himself for helping. He loved spreading the peanut butter on the crepes and carefully assembling his kabob. The great thing about this little Mother’s Day project is that we only had to make one stop (at Meijer) to get everything we needed! Meijer is great for creative kitchen projects like this! 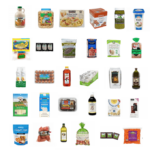 While we were doing our weekly grocery shopping, we snagged all the recipe ingredients we needed – from the fresh fruit to the chicken sausage and eggs, to the flour and milk for the crepes. 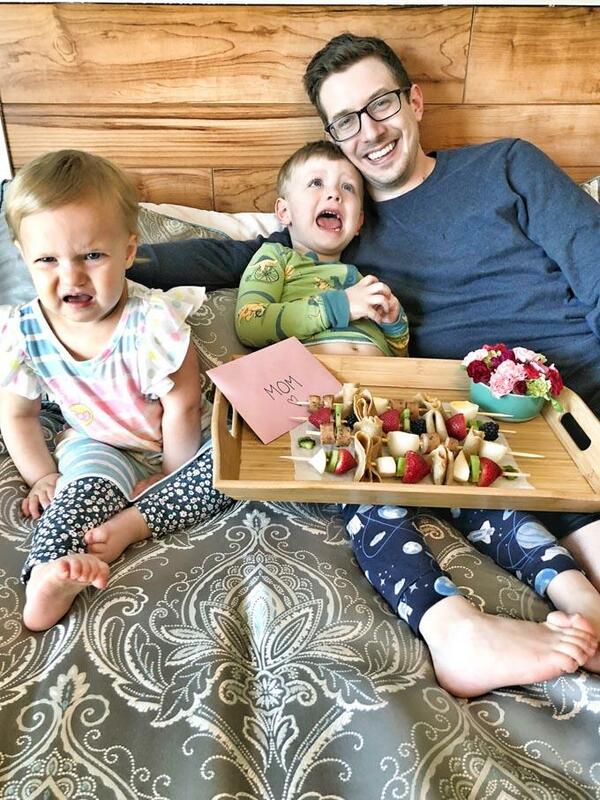 We also grabbed some wooden skewers, a Mother’s Day card, some beautiful flowers, and a cute bamboo tray to make it easy for the kiddos to treat mom to breakfast in bed! My hubby makes a great breakfast and I told him I’d love it if he helped the kids make me some Crepe Kabobs for breakfast on Sunday! Now let’s talk about the crepes themselves! I opted to make two versions: sweet and savory, so there’s something for everyone. 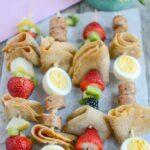 The sweet version has crepes filled with peanut butter and lots of fresh fruit while the savory version has crepes filled with cheese, chicken sausage, and hard-boiled eggs. 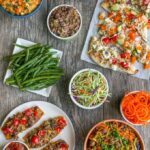 You can easily do all sweet or all savory, change things up with different fruits or use fried eggs and breakfast sausage if you wanted! The crepes can be made the night before and stored in the fridge so then in the morning, all you (or your husband) have to do is spread the peanut butter or melt the cheese, fold them up and assemble your crepe kabobs. For the crepes themselves, I made mini versions so that they wouldn’t be super giant when I folded them up and put them on the skewers. One batch of batter made about 16 mini crepes. 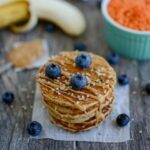 These are such a fun and festive breakfast treat, but really you don’t need a special occasion. 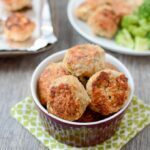 Make these for a quick weekday breakfast or an after school snack if you want, just for something different! In a bowl, combine eggs, flour, butter and milk. Add milk slowly and whisk until well mixed. (You can also mix everything in a blender). Heat a pan over medium-high heat. Grease pan with butter or oil. Add 2 Tbsp batter to the pan. Tilt the pan to spread into a thin circle. Let cook about 1 minute before flipping. Repeat with remaining batter. Spread peanut butter over half the crepe, fold in a half and then in half again. Or sprinkle shredded cheese on half, microwave to melt and then fold into quarters. For sweet kabobs, alternate fruit and 2 peanut butter-filled crepes per skewer. For savory kabobs, alternate chicken sausage, hard-boiled eggs and 2 cheese-filled crepes per skewer. Add vanilla, cinnamon and 2 tsp sugar to your batter for even sweeter crepes. 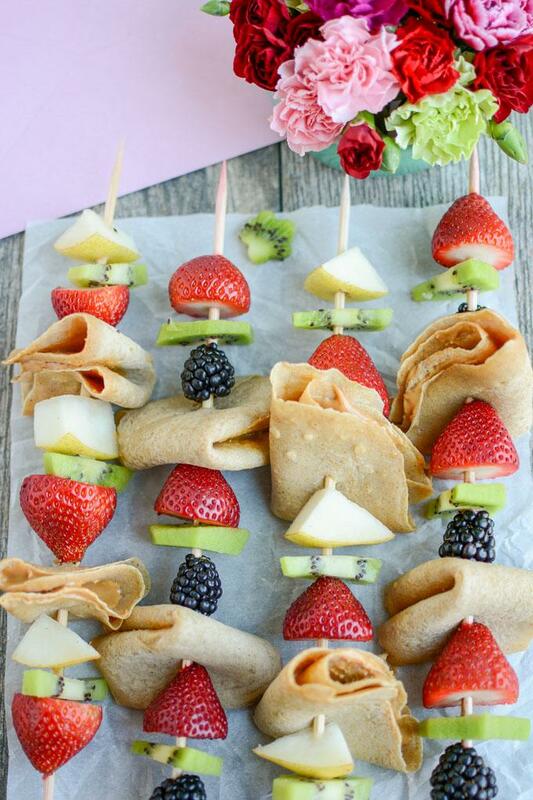 Feel free to use your favorite kinds of fresh fruit, sausage and eggs to make the crepe kabobs to your liking! 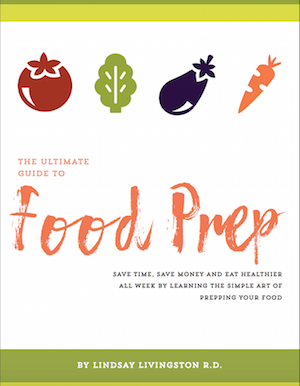 You could also add roasted veggies like sweet potato or peppers to the savory kabobs! 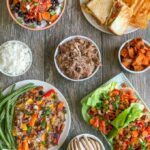 I love the True Goodness products and used several of them in this recipe. 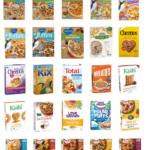 While the True Goodness brand flour isn’t gluten-free, there are lots of gluten-free flour options available at Meijer! 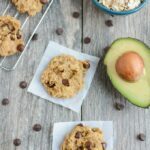 Mamas- share this recipe with your co-parent ASAP so they can head to Meijer and get everything they need and put the kiddos to work on Mother’s Day. You deserve a break! And what’s cuter than a toddler serving you breakfast and bed? And then attempting to eat all your breakfast before you even get a chance?! thank you! Q would love making them! Yum! And so much fun! !